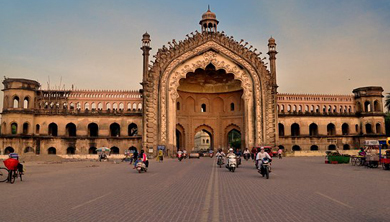 To discover the amazing heritage of Lucknow, take a guided tour of the old city and the Chowk area. The walk starts from Lal Pul, Tila Wali Masjid and goes through the Bara Imambara and Chowk Bazaar and ends near Akbari Darwaza. Walk leader point out interesting facets of the old city and Lucknow’s fascinating history that no book could tell you. You'll sample interesting nibbles such as refreshing thandai and get an insider glimpse into various traditions. 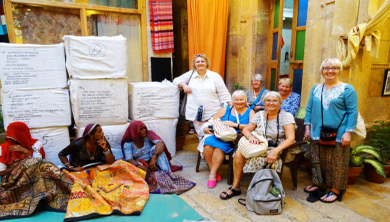 From indigo block printing to traditional Unani medicine of vark (edible silver foil) making. This is an eye-popping way to get your bearings among Lucknow’s oldest neighbor hoods. Chikankaari is a delicate art of embroidery that has become a major commercial activity in the city of Lucknow and its environs. Though the origin of Chikan work has not been affirmed, perhaps it is the corrupt form of the Persian word ‘chikin’ / ‘chikeen’ or ‘sequin’ which means a kind of cloth wrought with needlework. Amongst the many theories regarding the origin of this magnificent art, the most believable is that it was brought by the Mughals from Persia. Chikan embroidery today is synonymous to the lifestyle of Lucknow. No wardrobe is complete without this in Lucknow. The art has survived the ravages of time to stands tough till date. Some artisans achieved perfection to the level that even a needle could not pass through the fine jaali (net) woven by way of Chikan embroidery. The grace that the Chikan garment promises is incomparable to any other dressing style. Its simplicity and comfort is its beauty. 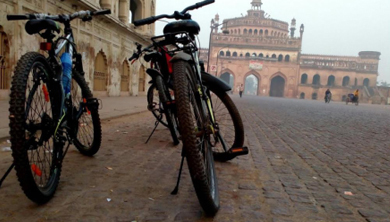 Bicycle Tour Of Old Lucknow. This is a tour of Lucknow on a cycle. The cycle tour has two Routes both of which start from Hotel Gomti. The timings of route 1 is from 6:30 AM in summers and 7:30 AM in winters. This tour covers places like Qaiserbagh complex, Residency, Chowk, Ferangi Mahal, Gol Darwaza, Clocktower, Chota Imambara, Kudiya Ghat, Rumi Darwaza, Chattar Manzil and Bara Imambara Complex. Route 2 of this tour starts from 6:30 AM in summers and 7:30 AM in winters, the journey first covers Shahnajaf Imambara, Ambedkar Memorial Park, La Martiniere, Dilkusha Garden, Vilayati Bagh, Kothi Bibiapur, Pipraghat cremation and Nawab Wajid Ali Shah Zoological Garden. This is a fun way to explore Lucknow getting a real picture of the culture and heritage. Evening Food Walk with Dinner. 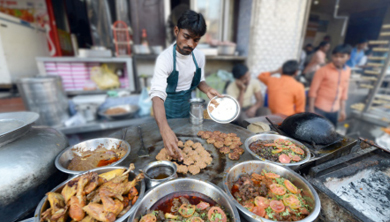 Lucknow is known for its culinary scene, dominated by rich meat-heavy dishes typical of the local Awadhi culinary traditions. With this food walk, you can try some of the best the city has to offer with an expert guide by your side to help navigate. You'll visit four different spot to try kebabs, curried lamb, and marinated skewered meat, as well as rich local desserts. Tonga Ride at Old City. 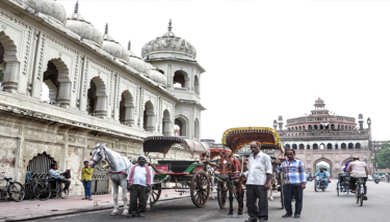 Feel the magic of riding in an open horse-drawn carriage through the heart of Lucknow City. The lavishly decorated two-wheeled carts that were used during the reign of the Nawabs as a means of conveyance are displayed here. The advancement of technology and the advent of fast cars may have replaced their use but not their novelty or charm. Starting from Bara Imambara, these carriages, known as Tongas, will give you an unforgettable tour of the City of Nawabs. Get to know the feature of Lucknow in the same way the Nawabs did and visit places like Rumi Gate, Jama Masjid and the banks of the river Gomti.